Our deals story for today bring you the best offer on the iPhone X, Seagate 2TB HDD, The Dishonored gaming title and more. 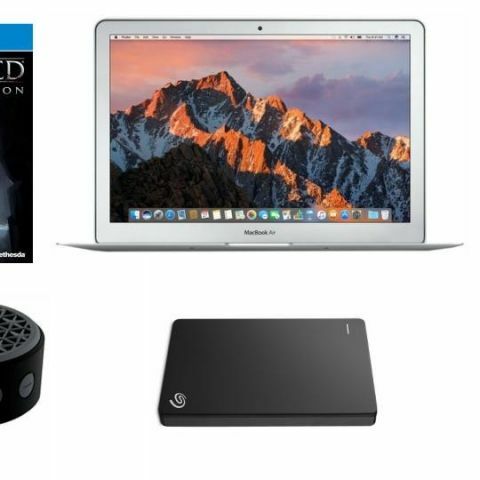 For our today’s deal roundup, we bring you new offers on laptops, speakers, fitness tracker and more. The iPhone X is available with a heavy cashback offer and so is the Samsung Galaxy Tab S3. There is also a gaming title thrown into the mix which is currently being offered at a highly discounted price. The 2017 MacBook Air is powered by the 5th Gen Core i5 processor with 8GB RAM and 128GB of SSD storage. The 15.6-inch laptop is equipped with two USB ports, an HDMI port and an SD card reader as well. Buy the device here. The 2TB Seagate Backup Plus Slim Portable External HDD comes with a USB 3.0 connection and promises of delivering transfer speeds of up to 3gbps. It is also compatible with PS4 and can be managed using the Seagate Dashboard software. Buy the device here. The Acer laptop features a 15.6-inch HD display and comes with the Nvidia GeForce MX150 GPU. It is powered by the latest 8th Gen Core i5 Processor with 8GB DDR4 RAM and 1TB HDD. You can buy it here. Definitive edition of the famous RPG gaming title Dishonored is developed by Arkane studios and is on sale at a discounted price for the PS4. You can buy the game here. The Logitech X50 Bluetooth speaker claims of delivering up to 5 hours of audio playback in a single charge. It can be connected wirelessly and also via a 3.5mm audio jack. It comes with a 1 year warranty as well. You can buy the device here. The Galaxy Tab S3 is powered by the Qualcomm Snapdragon 820 SoC with 4GB RAM and 32GB of internal storage. It is equipped with a 13MP rear camera and a 5MP front facing camera. You can buy it here. The iPhone X features an edge to edge display and comes with a 12MP rear and a 7MP front facing camera. The device is powered by the A11 Bionic chip and comes 64GB ROM. You can buy the smartphone here. The Logitech speakers boast of 200w RMS power rating and comes with two satellite speakers and a subwoofer. The device is THX certified and come with integrated controls and a headphone jack as well. You can buy the speakers here. The Lenovo HW01 Smart Band features a 0.91-inch OLED display and is capable of tracking the distance travelled, tracking steps, calories burnt, and sleep. It is compatible with both Android and iOS, and it also records the heart rate every 15 minutes using a dynamic heart rate sensor. You can buy the device here.